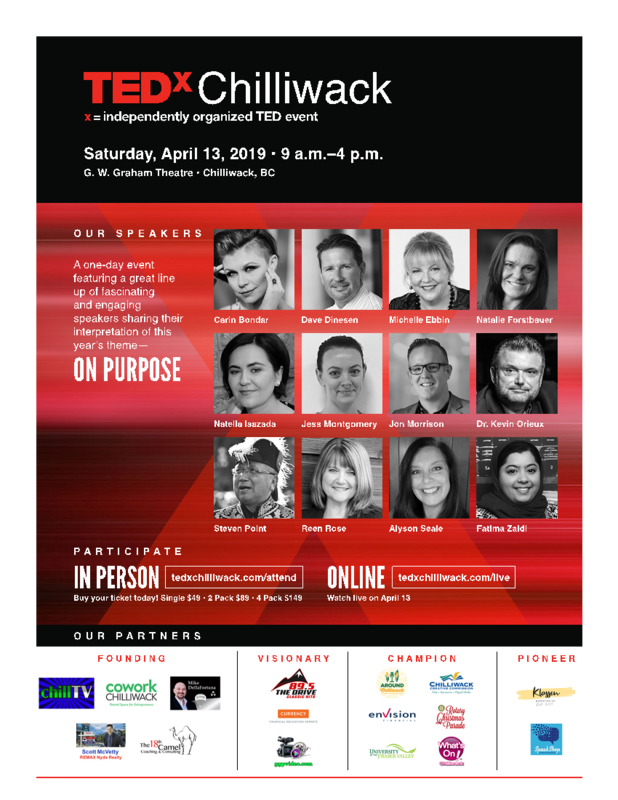 Chilliwack, BC – TEDxChilliwack is readying for their main event on April 13 at G.W. Graham Theatre. Twelve speakers, a handful of entertainers, and a day full of intriguing and entertaining talks will be shared by a large audience in the theatre, as well as interested TEDx fans from around the world, following along live on the internet. TEDxChilliwack (www.tedxchilliwack.com) is a not-for-profit, annual one-day event held in Chilliwack, British Columbia. Come hear live speakers share innovative and optimistic ideas with a community of open and curious minds searching for ways to make a difference. TEDxChilliwack is independently organized and operated under a license from TED.